Pink & Chevron Hair Bow Clip Set. Baby Girl Toddler Youth. Zig zag. Chiffon Bows. too cute and will match so much stuff! matches perfectly with the coral skirt I ordered her for Easter! You've asked. We've listened! Bigger flower styles coming soon! Exciting news! I've decided to bring our custom wipes cases back to the shop! This is how it all started for this little shop and I'm excited to add new designs starting in April 2016! Wedding Season is here! Sashes and matching hair accessories can be customized for your big day! Where to begin? Well, let's start with our name. It really is quite simple. My family and I reside in the Rogue Valley of Southern Oregon, and when brainstorming names, it just fit. The idea of starting The Rogue Baby began when I received a custom diaper wipes case as a gift when I was pregnant. I loved it! Shortly thereafter the time came for me to get someone a gift for their baby shower, I tried my hand at making my own wipes case. It was fun. Soon, I had created my own line of wipes cases, often embellished with my handmade flowers. In the meantime my daughter was a few months old and was such a sweet little bald baby. I had a hard time finding headbands that coordinated with her outfits and were affordable. I started making made to match headbands for her outfits. Over time and as my little one has grown, The Rogue Baby evolved into all things ruffles, lace, flowers, and girly that you see today. 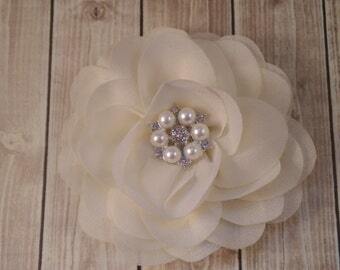 I thoroughly enjoy wedding season and creating hair pieces, garters, shoe clips, sashes, etc. for such important events. My diaper wipes cases are still one of my favorite things to create and I still make them by special request. My little Rogue Baby is now 8 years old and she loves being my assistant by helping me with the design process. Many of my items are one of a kind but some can be reproduced or replicated with slight variations as well. Hi, I'm Ricki! I am adoring Wife to a skilled craftsman, Mama to one amazing little girl & the face behind The Rogue Baby. As a native of the Pacific Northwest, I love a good microbrew & love good coffee even more!